Natalie R Harris recollects her experiences performing in the Olympic Opening Ceremony, one year ago today. One year ago, we were filled with doubt. 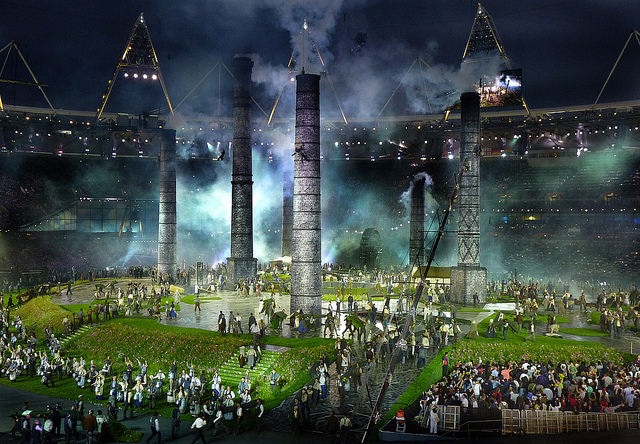 We just couldn’t conceivably believe that London could pull off the Games of the Thirtieth Olympiad on the world’s stage. Organisation, sustainability, legacy – all these words sounded so un-British. The first target for the critics? The Opening Ceremony, of course. Because, while press leaks resulted in speculations about a naff kind of grown-up Teletubbies, 10,000 volunteers were witnessing England’s green and pleasant land being torn up from its roots in a swathe of industrial madness. We saw real NHS workers don their swing shoes to fight off Voldemort. And we got to dance on stage with grimester Dizzee Rascal and World Wide Web inventor Tim Berners-Lee: a combination that nobody but the mad mind of Danny Boyle could have possibly conceived. At the time, I was swept up in the chance to be un-ordinary. I was disgusted with the haters, people who had no idea about what the army of volunteers went through – the personal journeys we took to get to the evening of the 27 July 2012. I remember the early mornings, the costume fittings, the long rehearsals. I remember the impossibly fast routines, the days in a Dagenham disused Ford plant, the giant blisters. I remember entering the Stadium for the first time and watching each chair light up in sequence. I remember rain dancing in plastic ponchos, donning my 1960s costume (complete with purple wig) and getting photos taken with chimneysweeps and nurses and human doves. I remember waiting to run on stage, the heat from the Firestarter flames, and running up a slippery Glastonbury Tor. These are all specific memories about a specific time and place that nobody can ever take away from me. The Opening Ceremony obliterated a nation’s doubts with iron-forged Olympic rings, the Queen’s acting debut, a lesbian kiss and a crescendo of fireworks. It imprinted Team GB on our hearts: a group of individuals who went on to fulfil their own personal legends. And we Olympic Ceremony volunteers were most certainly heroes…but just for one day. Because today, one year on, I’m under no illusions that the visual spectacle that 10,000 of us created wasn’t anything other than a moment in time. The ‘legacy’ that was so often mocked by the press and the people didn’t come from one show – it came from the un-British compassion that was created as a result of supreme performances from athletes whose lives are devoted to being better than the lot they’re given. I still get invited to volunteer reunions and the odd flash mob performance. But you won’t see me at any of them. For me, it’s not about dwelling on what we did for one night, but about everything that happened since: people smiling at each other on the tube, returning to the Olympic Park for concerts, joining local sports clubs, running in the sunshine and, most importantly, ditching the doubt. And if you do need a reminder that London is still the best city in the world, you could do worse than watching the Opening Ceremony anniversary repeat on BBC Three. Just saying. By Natalie R Harris. Image by Jon Smith in the Londonist Flickr pool. The Director's Cut of the Olympic Opening Ceremony screens at 7pm, Saturday 27 July 2013 on BBC3.